The coast of Calabria has some beautiful names, the Costa Viola named after the colour of the water reflecting the land’s greenery, the Costa Tirrenica which to me sounds strong and warrior-like and the Costa degli Dei: the Coast of the Gods, which upon first sight needs no explanation, 55km of white sand and turquoise sea. Welcome to paradise. Undoubtedly the most popular destination for tourists to Calabria, the Costa degli Dei has beach after beach of powdery white sand, clear blue sea and photo opportunity after photo opportunity. Stretching from Pizzo in the North to Nicotera in the South, you can spend days Robinson Crusoe-ing to find your favourite beach and you’ll be spoiled for choice. With rock formations creating tiny secluded bays only accessible by boat or on foot it is possible to spend a whole summer never visiting the same beach twice. A snorkeler’s dream you can admire the sea life and soak up the sun before watching a dramatic red sunset over the Aeolian islands as Stromboli smokes away. It really is that beautiful. The town that tourists flock to, the jewel in the crown as it’s often named, is Tropea. A cliff-top historic town, built on a Byzantine cemetery offers the perfect combination of jaw-dropping architecture and postcard views of the Costa Bella. Last weekend we decided to go for a stroll around this beautiful town in search of a gelato with a view. 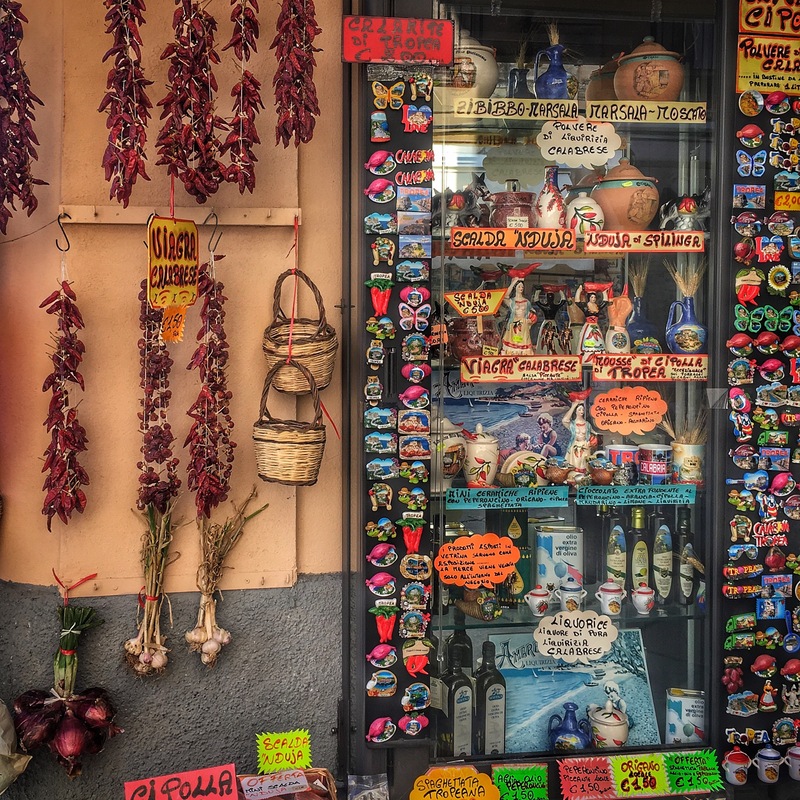 If you mention Tropea to most Italians they will most likely wax lyrical about onions. This is because some of the sweetest red onions in all of Italy come from this region and are famous all over Italy. If you are lucky enough to be visiting in July you can attend the Sagra di Cipolle rosse (the red onion food festival) where you can see for yourself all the amazing dishes that can be made using these beautifully sweet onions. After wandering through the cobbled streets, having admired the baroque architecture, indulged in an aperitivo while watching the passers-by and laughed at the slogan t-shirts and the chilli pepper garlands that are advertised as the Calabrese viagra, it’s probably time for a gorgeous gelato. 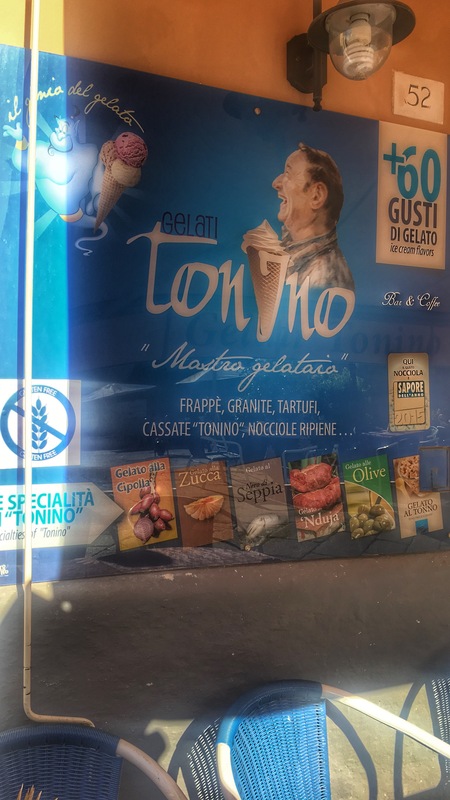 While there are of course a large number of gelateria’s in Tropea, there is one that you simply can’t miss, Tonino. This unassuming gelateria proudly boasts over 60 flavours including (for the more adventurous palate): red onion, pumpkin, squid ink, ‘nduja, olive and tuna! Certainly makes a change from chocolate! Ice cream in hand, you’ll probably make your way down to the balcony at the end of the street to see why people are gathering there. Then it hits you. One of the best views in Calabria. Far below you is an expanse of crystal clear water hitting fine white sand and all this being overlooked by the Santuario benedettino di Santa Maria dell’Isola. Get your camera ready. As evening falls the bars and restaurants replace cocktails and stuzzichini with local seafood and live bands and you will have the opportunity to see some fine Italian fashion on display as people flock to enjoy the bustling nightlife. Tropea and the Costa degli Dei are places you have to visit at least once in your lifetime. They offer a feast for the eyes and the palate. But don’t just take my word for it, come here for yourself and see if you’re a believer. My family is from Bari, but they always speak of Tropea. I hope to visit one day. Looks like an amazing place. Oh wow, that is just beautiful, your photos are gorgeous! Do you know how child friendly it is by any chance? What is ‘nduja? Tropea sounds heavenly. I have family in Crotone. We visited once in 2009. We are long overdue for another visit. 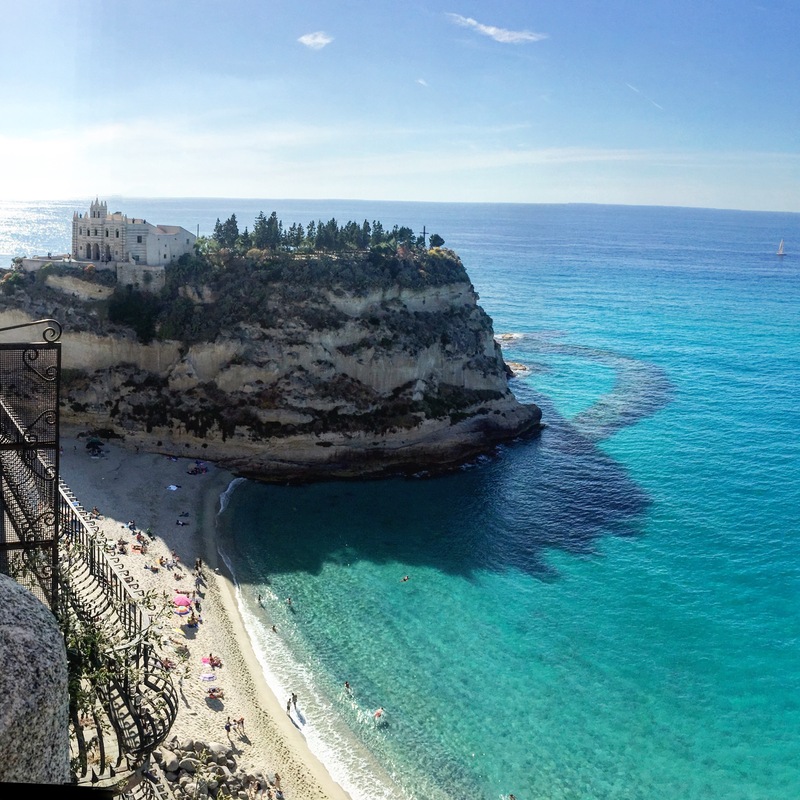 This time we must see Tropea! Wow this looks beautiful! I would love to go here! Putting it on my travel bucket list. What a spectacular place ,the beaches are beautiful, would love to visit it some day. Italy is on my to visit list. Wow. Going on my travel bucket list. I love how you write and the place looks beautiful, lovely photos as well. Thank you, that’s so kind. Calabria is truly gorgeous, just noone knows about it! Your photos are really captivating and just the name “coast of the gods” was enough to sell it to me! Wow, this is absolutely stunning!! Would love to go there some day! This place is breathtaking! I hope to cross it off my bucket list soon!